During occultations, scientists observe the brightness of a star as the rings pass in front of the star. This provides a measurement of the amount of ring material between the spacecraft and the star. Cassini has given scientists the most detailed view yet of Saturn's densely packed B ring. Cassini found that this part of the rings is densely packed with clumps, called self-gravity wakes, separated by nearly empty gaps. These clumps in Saturn's B ring are neatly organized and constantly colliding, which surprised scientists. The clumps in Saturn's B ring, 30 to 50 meters (100 to 160 feet) across, are too small to be seen directly. However, scientists can map the distribution, shape and orientation of the clumps. 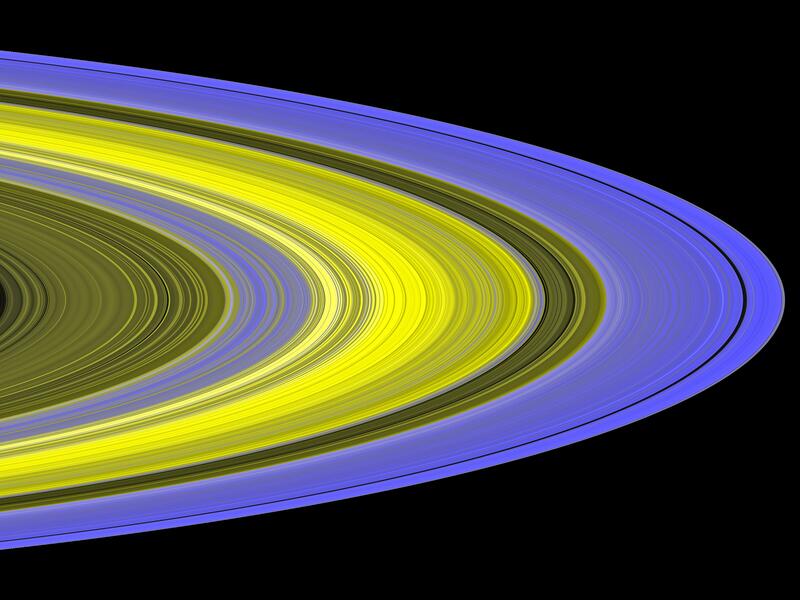 Colors in this image indicate the orientation of clumps, and brightness indicates the density of ring particles. The formation of wakes is strongest in the bluer regions, where ring particles clump together in tilted wakes. Particles in the central yellow regions are too densely packed for any starlight to pass through. The ultraviolet imaging spectrograph measured the flickering of the star Alpha Arae as it passed by the rings Nov. 9 and 10, 2006. The Cassini-Huygens mission is a cooperative project of NASA, the European Space Agency and the Italian Space Agency. The Jet Propulsion Laboratory, a division of the California Institute of Technology in Pasadena, manages the mission for NASA's Science Mission Directorate, Washington, D.C. The Cassini orbiter was designed, developed and assembled at JPL. The ultraviolet imaging spectrograph was designed and built at, and the team is based at the University of Colorado, Boulder. For more information about the Cassini-Huygens mission visit http://saturn.jpl.nasa.gov/home/index.cfm . The ultraviolet imaging spectrograph team home page is at http://lasp.colorado.edu/cassini .